Take advantage of the early bird discount for RehabWeek 2019 by registering by April 16th! You can also meet our partner Hocoma, the global market leader for robotic and sensor-based devices for functional movement therapy, at RehabWeek. Read more here. 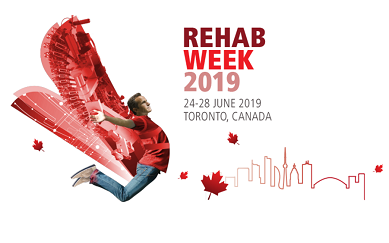 RehabWeek (24-28 June) is hosted this year in Toronto, Canada and will address the current challenges and opportunities in rehabilitation, bringing together colleagues and partners to exchange, debate and network. As the healthcare landscape continues to evolve, close cooperation among clinicians, engineers, researchers, scientists, health practitioners, policy makers, users and industry is essential for making positive changes for patients and their families, our communities, and the world. Hocoma’s founder and CEO, Dr. Gery Columbo, presides over the International Industry Society in Advanced Rehabilitation Technology (IISART) as part of the International Neurorehabilitation Symposium (INRS), one of the core organisers of RehabWeek. Read more. If you are interested in pushing the field of Rehabilitation Technologies forward by exchanging your ideas and sharing your experiences with engineers, clinical researchers and clinicians from all around the world, register here: www.rehabweek.org/registration.